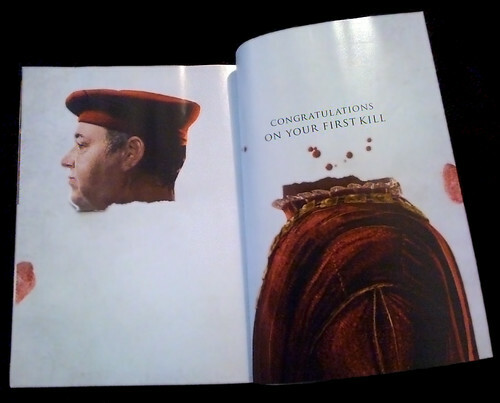 I recently saw this print campaign for Assassins Creed 2, and it floored me. The pages appear to be stuck together, so when you open them, you are actually physically tearing the head off the figure. So many print campaigns for video games do not capture the spirit of interactivity that is integral to playing a game, and as such, they do not excite me. This ad is interactive, and appropriate to the content of the game. Kudos, Assassins creed marketing department! his head would be on backwards when the pages are closed, weird. Only if you think in terms of pages. Were you to, say, rip it off with your hands, this would be the correct orientation. I got a copy of this advert at PAX this year. Had to keep it just because I thought it was too good to trash.